Kempinski The Dome is arguably the finest hotel in all of Belek, which is quite a claim, as the resort town is home to 32 four or five star establishments. The Dome is best classed as 5* deluxe, and is truly spectacular. 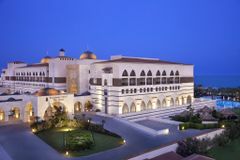 The architecture and design of the hotel are heavily influenced by the presence of the Seljuks, whose 12th century empire has left a lasting legacy on the region. The Dome is located in one of Belek's most charming corners, and boasts 157 bedrooms and 18 private villas, all featuring marble bathrooms. Notable features include full air-conditioning, wooden floors, flat screen televisions and private balconies. Grandeur and opulence best describe Kempinski Hotel The Dome, which is the luxury choice for the discerning golf traveller to Belek. As well as the unspoiled sandy beaches at the resort's edge, Kempinsky Hotel The Dome also has huge outdoor swimming pools, jacuzzis, saunas and a well-equipped gym. In addition, the resort is home to one of Turkey's largest Spa and Thalasso Therapy centres, purpose built to ensure complete relaxation and revitalization. There are tennis courts, water sports at the beach, and a great kids club, making this the perfect family destination. There are four restaurants at The Dome; our favourite is the Selçuk, whose regional cuisine shows the local flair and tradition. There are six bars in the hotel, including the Putters Bar, dedicated for golfers.